FILE - A man watches a TV news program, Oct. 16, 2016, showing a file image of a missile launch conducted by North Korea. While the Trump administration explores options to curb North Korea's nuclear development, efforts are under way in Congress to push for additional sanctions against the regime. The move comes amid growing speculation that the isolated state may soon conduct another nuclear test. South Korea believes North Korea is ready to carry out a nuclear test anytime leader Kim Jong Un decides to do so. Recent commercial satellite imagery showed an increased level of activity at the North's Punggye-ri nuclear test site, according to the U.S. monitoring website 38 North. Ed Royce, chairman of the House Foreign Affairs Committee, called on the Trump administration to take additional steps to deny the North the hard currency that enables the country to advance its missile and nuclear programs. 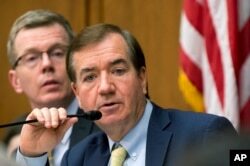 FILE - House Foreign Affairs Committee Chairman Rep. Ed Royce, R-Calif., presides over the committee's markup of the Iran Terror Finance Transparency Act on Capitol Hill in Washington, Jan. 7, 2016. "We are indicating to the administration that they already have important tools at their disposal," the Republican lawmaker from California told VOA on Thursday, when asked what the Trump administration should do to counter the nuclear threat. Royce introduced new legislation to tighten existing sanctions on Pyongyang. The legislation passed by the House panel Wednesday targets front companies and enablers that fund the Kim regime's nuclear program and human rights abuses. It also requires the Trump administration to determine whether North Korea is a state sponsor of terrorism. 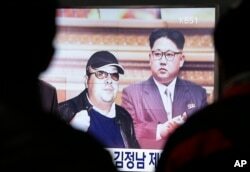 The call for the North to be relisted as a state sponsor of terrorism has gained renewed attention after the assassination of Kim Jong Nam, the estranged half-brother of North Korean leader Kim Jong Un. The lawmaker said the measure would "vastly expand the administration's authority to use sanctions to address this emerging North Korean threat." Royce stressed the need for increased sanctions on the North, saying the communist state is using "sophisticated tactics" to evade sanctions. "Sanctions enforcement from other nations remains insufficient," he added, citing a recent United Nations report. The French news agency AFP reported the value of China's coal imports from North Korea surged nearly 40 percent in February despite Beijing's earlier pledge to ban such imports as part of the implementation of the latest U.N. sanctions. It is unclear if the purchases had been made before the suspension came into force or Beijing backed away from its previous pledge. In a report on the implementation of the sanctions, China said the imports were suspended from Feb. 19, 2017, to Dec. 31, 2017. Recently, the Trump administration vowed that its North Korea policy will differ from its predecessor's. "The policy of strategic patience has ended," U.S. Secretary of State Rex Tillerson told reporters in South Korea this month. "We are exploring a new range of diplomatic, security and economic measures." This report originated with the VOA Korean Service.